The Astronomer and I began our third day in Saigon across the river in District 4, a densely packed island we called home for the better part of a year. In the three years since we’ve been gone, the old neighborhood has undergone quite a makeover. While the river is still as murky as ever, dirt roads have been transformed into sturdy bridges and run-down shacks have given way to shiny highrises. The lay of the land was so unfamiliar that The Astronomer had trouble navigating the streets at several turns. Rapid development can be mighty disorienting. Fortunately, the vibrant street food scene hasn’t changed one bit. After stopping to pick up some xoi gac from my my favorite sticky rice vendor on Ton That Thuyet Street (pictured above), we searched the district for more good eats. 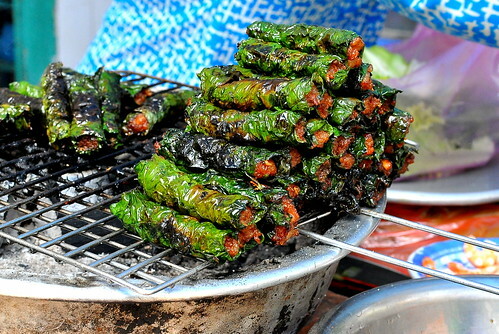 The smell of grilled seasoned beef wrapped in betel leaves brought our motorbike to a rapid halt. Even though we had just eaten bo la lot a few meals ago, it was too tempting to pass up. 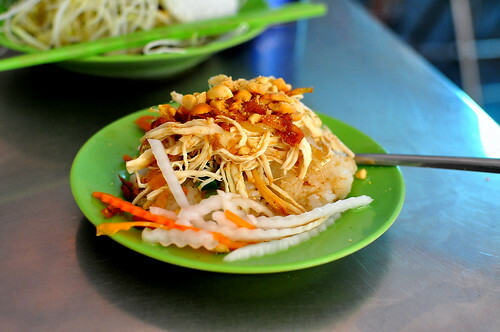 The Astronomer’s bowl of bun bo la lot was piled high with herbs and sprouts tucked underneath a tangle of cool vermicelli noodles, peanuts, pickled carrots and daikon, and a swipe of crushed fresh chilies. Everything was evenly dressed with fish sauce. The best bites included a pinky-sized bo la lot nugget. 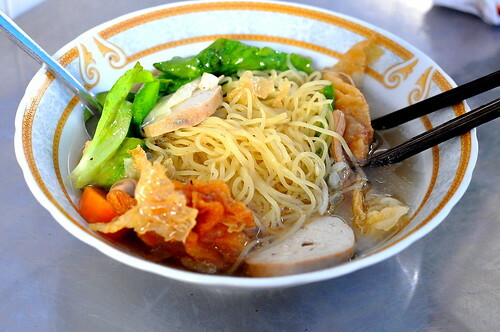 I ordered a bowl of vegetarian noodles from the bo la lot vendor’s neighbor. There usually isn’t much vegetarian street food, but because it was the mid-Autumn moon festival, many vendors were catering to local Buddhists refraining from meat. With heaps of noodles, plenty of mock meat, and a savory broth, the bowl of noodles was totally satisfying. Vietnamese vegetarian food is the best. As luck would have it, a che seller was stationed on the other side of the bo la lot stand. 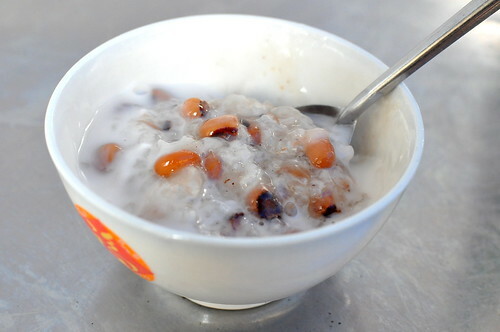 For dessert, I dug into a bowl of che dau trang comprised of sweet glutinous rice, black eye peas, and warm coconut milk. Just like the good ‘ol days, we ordered a plate of xoi man—sticky rice with fried shallots, dried shrimp, chicken, Chinese sausage, scallion oil, peanuts, and pickled vegetables. And a plate of goi du du kho bo—green papaya salad with fresh basil, a shrimp chip, strips of beef jerky, and crushed peanuts. Both dishes were deliciously nostalgic. 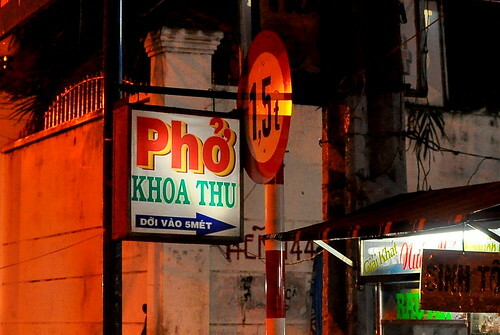 We returned to District 4 a few nights later when The Astronomer was craving pho bo from Pho Khoa Thu. 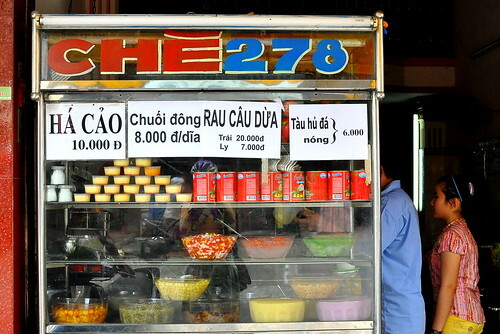 He discovered this roadside stand toward the end of our stay in Vietnam and has yet to find a bowl of pho anywhere that can top it. 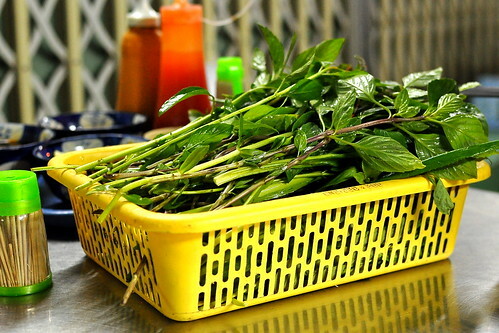 …and the biggest basket of fresh basil and saw-tooth herb. I added plenty of fresh herbs to my bowl and made a saucy concoction of chili oil and lime juice to dip slices of rare beef in. 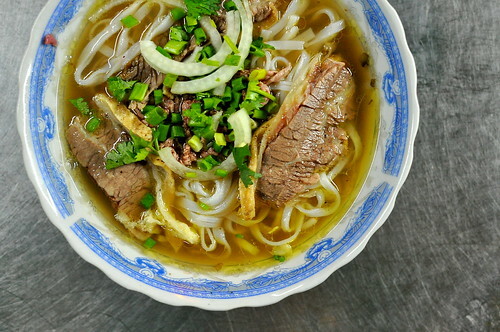 Our bowls of pho came with an assortment of tendon, flank, and rare beef served over wide rice noodles and topped with a mixture of white onions, scallions, and cilantro. The broth at Pho Khoa Thu is oily, rich, and aromatic like you wouldn’t believe. In fact, it was the aroma of anise and charred onions wafting in the night air that originally seduced The Astronomer into visiting the stand. Both of us buried our faces in our bowls of pho and didn’t look up until the contents were emptied. Some things are meant to be savored in peace. District 4 is truly our home away from home. District 4 looks like stairway way to heaven! I am dying for some vietnamese vegetarian food now and i want that che dau for breakfast when i wake up after a night spent dreaming about one day visiting your old stompin grounds. 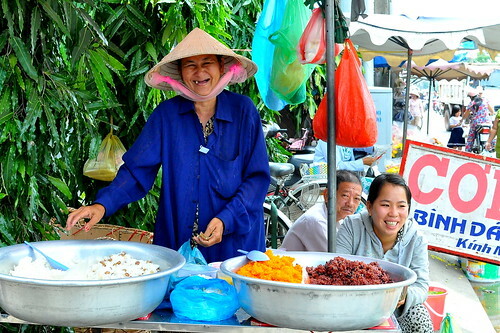 So sounds like I need to plan my visit to Vietnam during the mid-Autumn moon festival! Bring on the veggies! 😉 Though really, everything looks and sounds amazing! I think D would be perfectly happy taking lots of B’s out there! Great to read about your revisiting old haunts. Makes me really look forward to my next trip back! 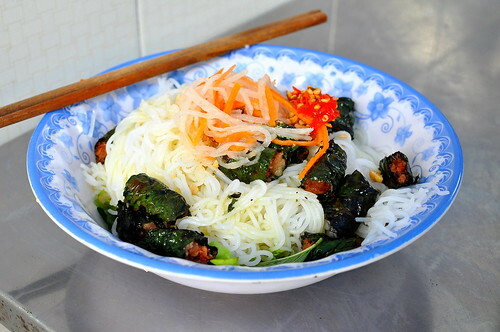 We are planning a trip to Vietnam for 2013…I hope I can find these good eats! 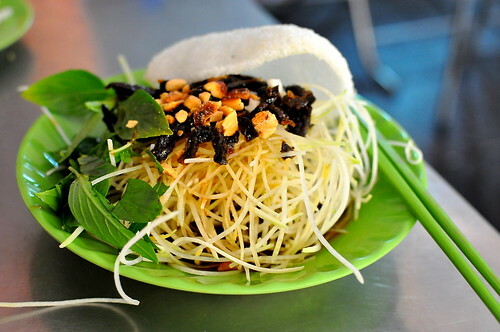 wow these eats are really making me want to go back to Vietnam asap and check out the south! I totally agree with one of your last statements. Whenever something is amazing, people eat in silence – almost afraid that talking would ruin the dish. This is especially true with my loud family. Heh. 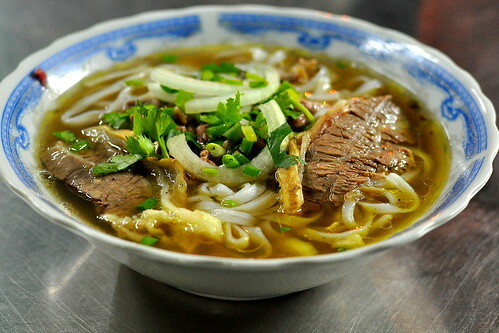 Great post with wonderful photos of the amazing food of Vietnam. Still my most favourite place I’ve travelled to. Some of the best tasting food on the planet! Can’t wait to go back for another visit! Well we took the hint and got ourselves to Q4 two mornings ago… Fresh off the plane, first time in Vietnam, so the morning of eating and perambulation was just fantastic! 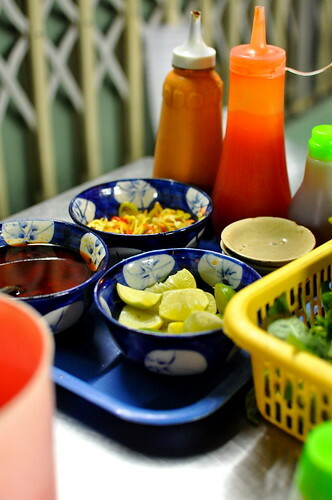 The breakfast soup was so far the best we have eaten in HCMC with an amazing bunch of flavours and textures. Found a great spot for some super sweet Vietnamese iced coffee. This is a district to visit if you want to get off the beaten track a bit, we were the only non-locals around at the time. It’s also a place to go to see a side of the city that’s not all glitz and glamour, the poverty is a bit closer to the surface here. Great sights and sounds especially as the street vendors fire up their trade. Amazing! Cost us about 70,000 to get a taxi one- way from Le Loi in Q1. Summary to foodies and visitors – go there! I’m so glad I stumbled across your site. I’ll be in Vietnam for the next 2 weeks and have found it really hard to research quality, non-touristy food places in the various cities I’ll be visiting. Thank you so much for all of your great tips! I suppose the only issue is the crime and unsafe feeling after dark in district 4. Small price to pay for good food.